This is the sixth article in a special series written by ILSR’s Stacy Mitchell and published by Grist. You can read the whole series here. Earlier this year, the New Jersey Sierra Club and the Pinelands Preservation Alliance tried but failed to block a permit for a new Walmart supercenter in the small coastal town of Toms River. The development, now moving forward, will destroy habitat for the threatened northern pine snake. What’s especially frustrating about the project, local environmentalists say, is that Walmart already has a store in Toms River. It’s just a mile down the road and will be shuttered when the new supercenter opens. The Toms River site is one of several environmentally sensitive areas Walmart aims to pave over in the coming months. Many follow a similar pattern. In Copley, Ohio, Walmart wants to develop 40 acres of fields and wetlands, and then close another store a mile away. In Davie, Fla., the chain is seeking permission to destroy 17 acres of wetlands to build in a location that’s just a 15-minute drive from six other Walmart stores. The chain now has 698 million square feet of store space in the U.S., up from 530 million in 2005, plus another 287 million around the globe. Its U.S. stores and parking lots cover roughly 60,000 acres. In fact, it’s likely that Walmart’s land-use impacts indirectly contribute more CO2 to the atmosphere than all of its reported greenhouse gas emissions combined, including those from the electricity that powers its stores and the fuel that runs its trucks. And, yet, land use is utterly absent from Walmart’s sustainability program. Its 2007 sustainability assessment briefly mentions “the unintended consequences associated with land development.” But annual sustainability reports since then have been silent on the issue. Words and phrases like sprawl, compact, mixed-use, pavement, impervious, runoff, auto-oriented, household driving, transit, and pedestrian do not appear anywhere in these reports. Next year, Walmart plans to open at least 210 new stores in the U.S. A handful of these will be its new Express stores, which, at 10,000-15,000 square feet, are about the size of a Walgreen’s; they sell groceries and pharmacy items, and are designed to fit into dense urban areas without triggering a zoning review. But almost all of its new stores will be 185,000-square-foot supercenters built on virgin land at the edge of sprawling communities. Even in cities, Walmart still favors a big suburban-style store with a moat of parking. It only resorts to Express stores where necessity dictates. “They are not replacing the suburban model, but adding to it,” says Benfield. Walmart’s development projects often encounter a host of local and state environmental regulations, but the retailer is remarkably adept at getting around them. In California, for example, Walmart has been using the initiative process to evade the requirements of the state’s Environmental Quality Act. As Will Evans recently reported on California Watch, by gathering signatures and submitting its development proposals as ballot initiatives, Walmart ensures they won’t be subject to the act. Under the initiative process, city governments must either approve the projects outright, with no conditions, or spend hundreds of thousands of dollars to hold a special election. Facing daunting budget problems, most cities just give in. Over the last two years, Walmart has used this technique to secure approval for at least seven new supercenters across the state. The last thing the U.S. landscape needs is more retail space. At more than 40 square feet per capita, we now have twice as much retail space as we did in the early 1990s and nearly three times as much as Europe — and a shocking amount of it now sits empty. Even before the recession, Americans were unable to spend enough to support all of this development. The Denver metro area, which currently has at least 70 vacant big-box stores and a swelling supply of defunct malls, is typical of many American cities. 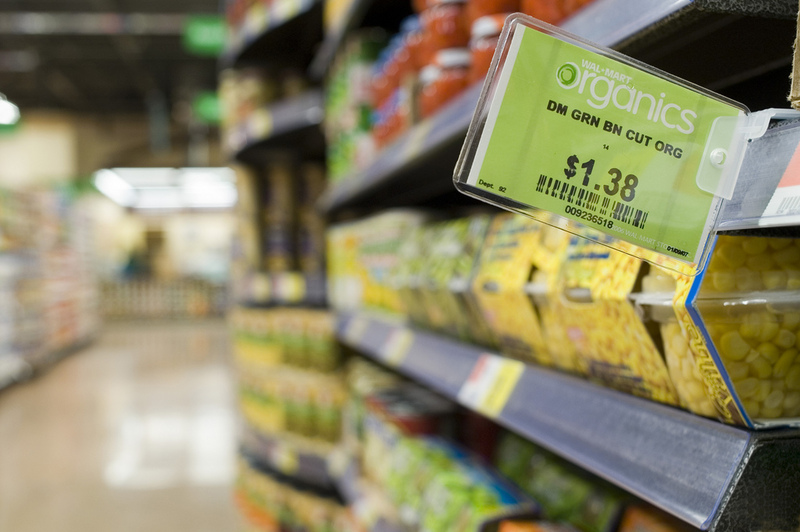 Walmart’s commitment to “zero waste,” which has led it to recycle a growing share of waste at its stores, does not, unfortunately, extend to reusing cast-off retail space — not even its own. The company’s realty website lists 150 available Walmart stores, some less than a decade old and most located barely a stone’s throw from a new supercenter. Apparently, Walmart has found there’s more profit to be made by building shiny new stores than by updating and expanding existing ones. 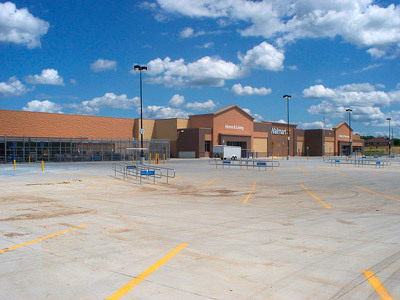 Walmart has signaled that it plans to continue treating its buildings as disposable. Last year, when it negotiated with SolarCity to put solar panels on some of its California stores, Walmart insisted on 10-year power-purchase agreements, rather than the usual 20 years, because it would not commit to occupying these locations for more than a decade. New Walmart stores are made mostly of cement and steel, two materials with high levels of “embodied” carbon, meaning they require a lot of energy to manufacture. These emissions are not counted in Walmart’s annual tally of its contribution to climate change. Nor does the company count the impact of turning CO2-absorbing forests and fields into asphalt. Far more significant, though, is how Walmart’s development patterns change our communities, reconfiguring their geography so that day-to-day errands require ever more driving. Between 1990 and 2009 — a period when Walmart grew from a regional chain to a national juggernaut — the number of miles the average American household logged each year for shopping grew by more than 42 percent, according to the National Household Travel Survey. By 2009, the average household was driving nearly 1,000 miles more to and from stores each year than it did in 1990. Driving in general increased during these years as more people moved to the suburbs, but shopping-related driving expanded six times faster than driving for all other purposes, including work, school, and recreation. Indeed, almost half of the total increase in driving in this period can be attributed to errands. It’s not that we’re taking more trips to the store. Households still report about 9 shopping trips each week on average. But each of those trips is about 2 miles longer. For the country as a whole, that’s an extra 149 billion miles on the road each year. Not all of this extra driving can be attributed to the rise of Walmart and other big-box retailers, but a sizeable chunk of it can. There used to be many more small and medium-sized stores — independent grocers, pharmacies, hardware stores, and so on — dispersed across city neighborhoods and town centers. Most people only had to go a short distance to pick up something for dinner or buy a can of paint. This more sustainable pattern, rooted in a time before most families had cars, began to fray with the advent of malls in the 1950s and ’60s. But it was the growth of retailers like Walmart, Home Depot, and Target that really decimated neighborhood businesses. While malls mainly sell clothing, the big boxes compete more directly with local stores catering to the day-to-day needs of a community. Today, retail is concentrated in a much smaller number of giant stores, each serving a larger geographic region than the many small stores it replaced. The inevitable result is that most households must drive a few miles more for most errands. The climate implications of all this are huge. To get a sense of the magnitude, say we attribute 10 percent of the increase in shopping-related driving since 1990 to Walmart. That’s probably conservative given how fast the company grew and the degree to which its stores have altered land use and traffic patterns, but 10 percent is Walmart’s current share of retail spending, so it’s a fair number to use. That would mean Walmart’s share of the extra miles driven is resulting in more than 5 million metric tons of CO2 emissions each year in the U.S. That’s almost a quarter of the company’s reported global CO2 emissions, which were at 21 million tons in 2009. Add in all of the other untallied climate effects of Walmart’s sprawl strategy and you can see how the company’s true carbon footprint balloons. So, while Walmart claims to be taking a leadership role on climate change, it is refusing to address — or even acknowledge — one of the most significant ways its practices affect the earth’s atmosphere.